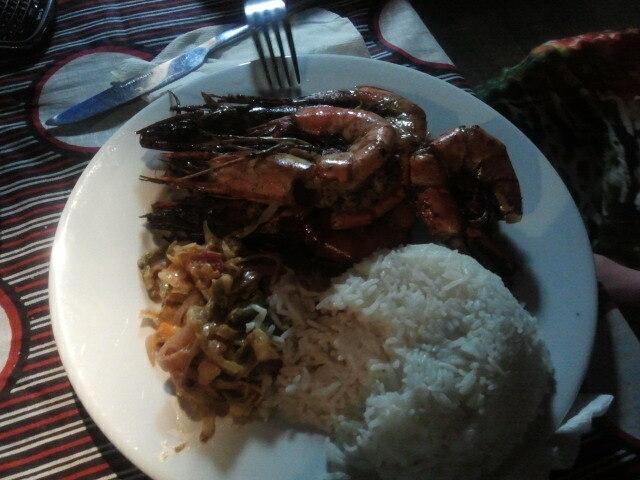 Our stay at Ponga Chumvi was great! The photos online are very accurate from what we experienced. At this point in our vacation we were very ready to kick back and relax for a few days in peace (we’d been on safari for 4 days and I’d survived the Mt. Kilimanjaro marathon) and that was exactly what we got. 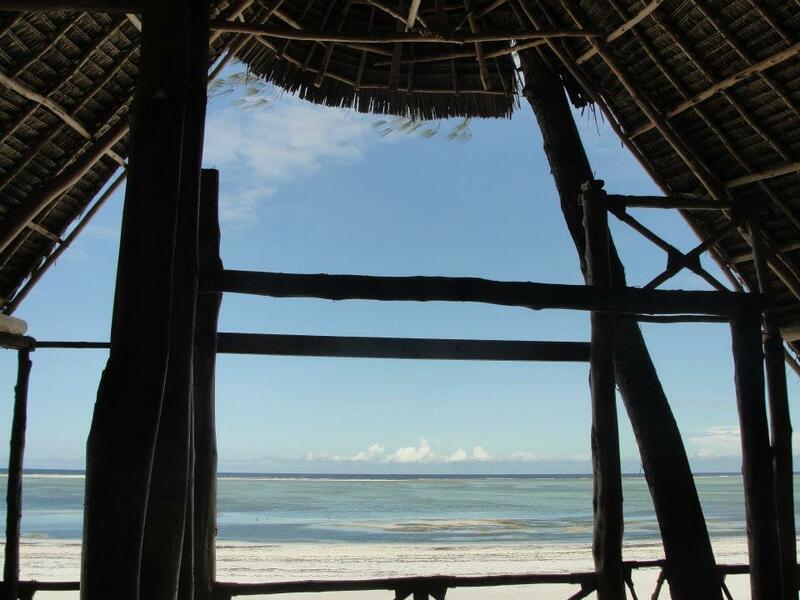 Our bungalow at Panga Chumvi was beachfront with a great big covered front porch, perfect for watching the sunrise and reading in the morning and unwinding at night. Inside it was simple and quaint but lovely. The sleeping area and private bathroom (with warm water!) were very clean and very well-kept. The beds were comfortable and the mosquito nets worked well. The common sitting/relaxing area also doubled as the seating area for the restaurant and was also beach front.This worked quite well actually. The chairs and tables were covered in bright fabrics and were comfortable. There was reliable wireless internet when we needed it and adorable kittens keeping us company. 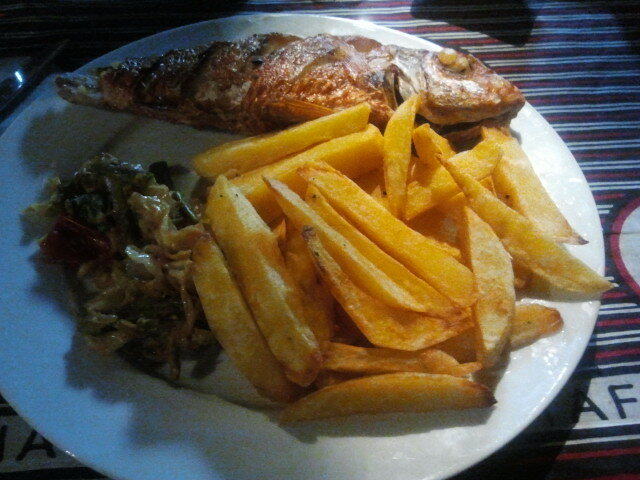 As if this wasn’t enough, the icing on the cake at Panga Chumvi was the wonderful breakfast served every morning. It wasn’t anything extravagant, but it was absolutely perfect. 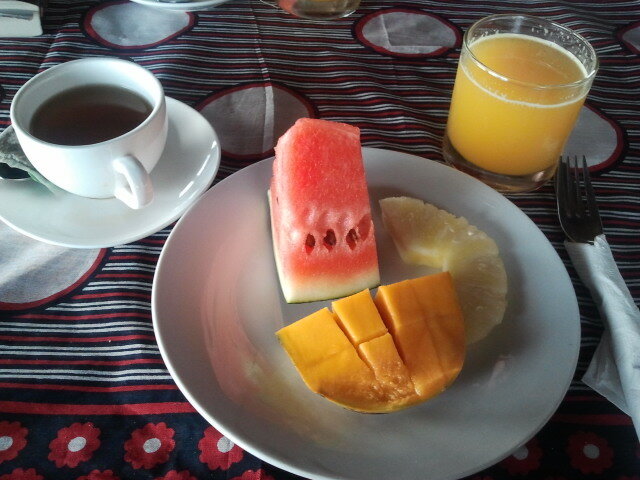 First there was fresh mango, pineapple and watermelon with coffee and freshly squeezed orange juice. 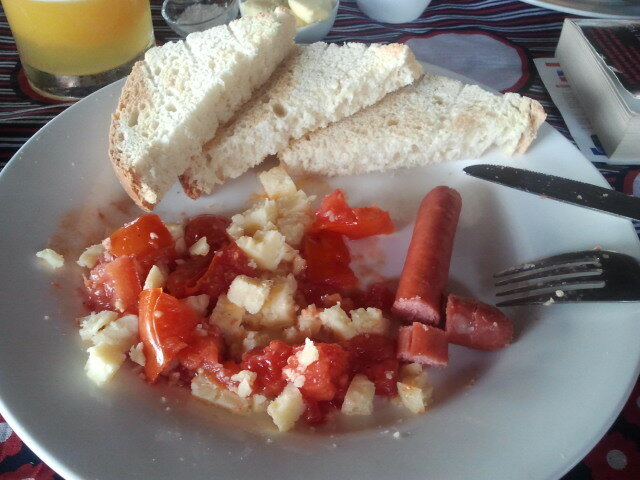 And then tomatoes, cheese and sausage with toast. 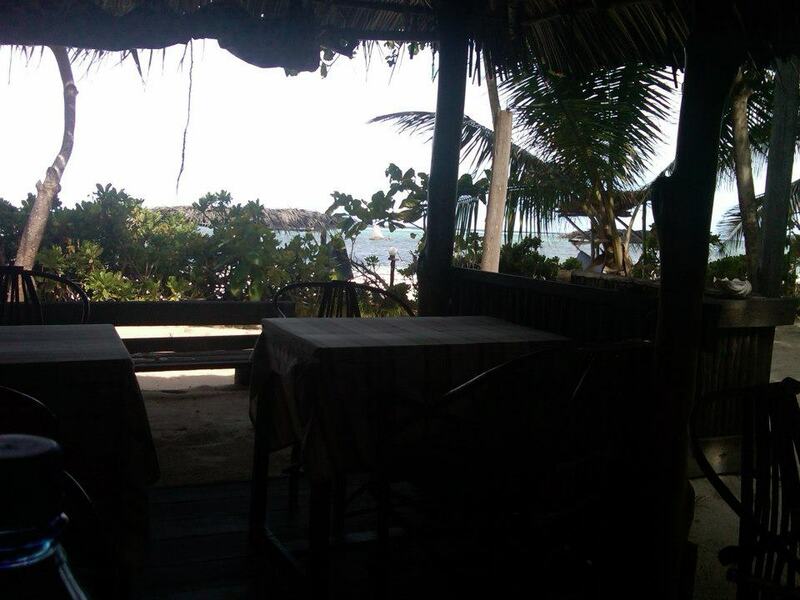 Very few mornings will be able to beat waking up to the sunrise and a good book on the porch and then breakfast at Panga Chumvi. The owner, Rebecca, and the rest of the staff were great. All of our questions and concerns were addressed right away during our stay. There were also tour guides and masseuse associated with our hotel and the other similar little get aways that dotted the beach in either direction of us. I’m not sure how tightly/loosely these people were associated, but they were all quite helpful. 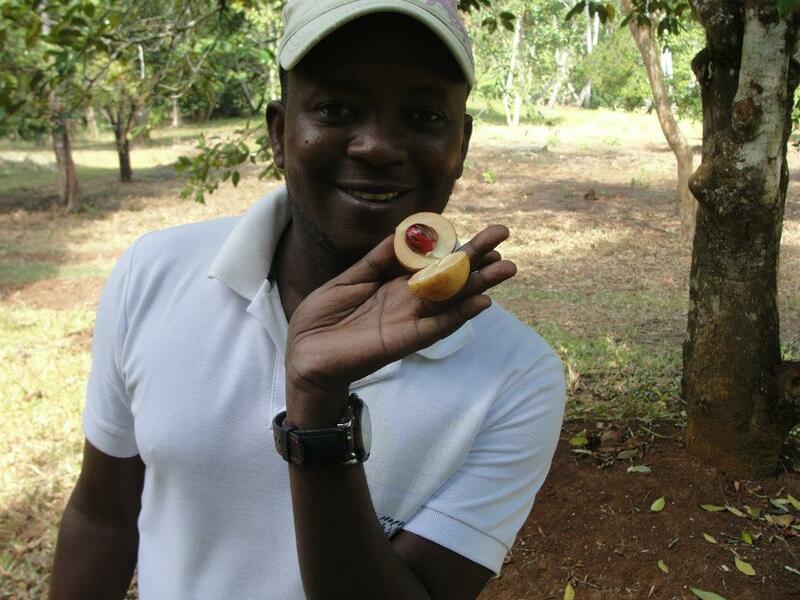 One tour guide arranged for a spice tour and a trip in to Stone Town for us. Another guide arranged our transportation to and from Stone Town when we were coming and going and with yet another we arranged a 2 hr snorkeling tour. Prices between different guides varied quite a bit (by a factor of 2 in some cases…$20 USD/person vs $40 USD/person for snorkeling and $50 USD vs. $60 USD for a ride into Stone Town for example) so shopping around is worth while. We didn’t do multiple tours so I’m not sure how the quality also varied with the price, but I’m pretty sure that the rides into and out of Stone Town were all pretty comparable. Unfortunately we also didn’t have a chance to capitalize on a massage. 😦 This is one additional thing that would have been great to include during our stay. 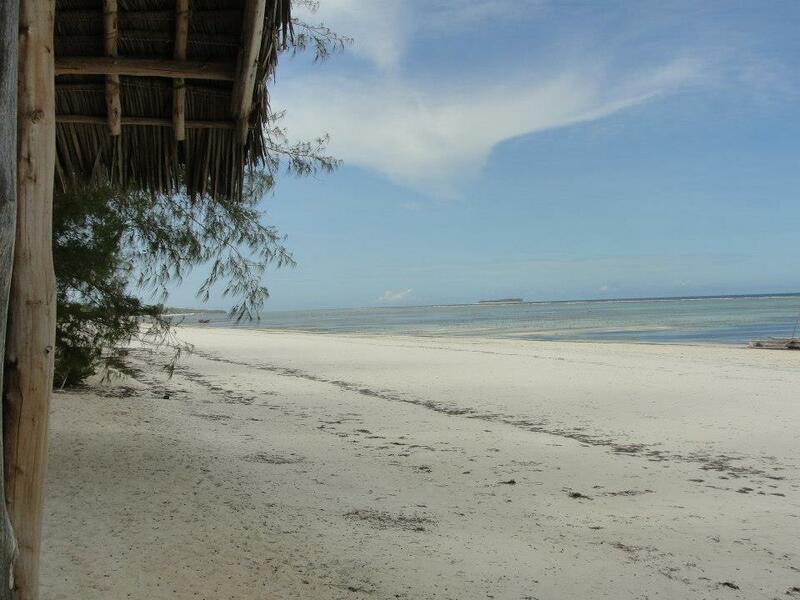 Panga Chumvi is located ~1 km from the (very hidden and very small and very hard to find town of Matemwe on the eastern coast of Zanzibar (Tanzania). It takes about 30 min by cab ($50 USD) and 1 hr by daladala (although we never did this) to reach from the main port Stone Town. 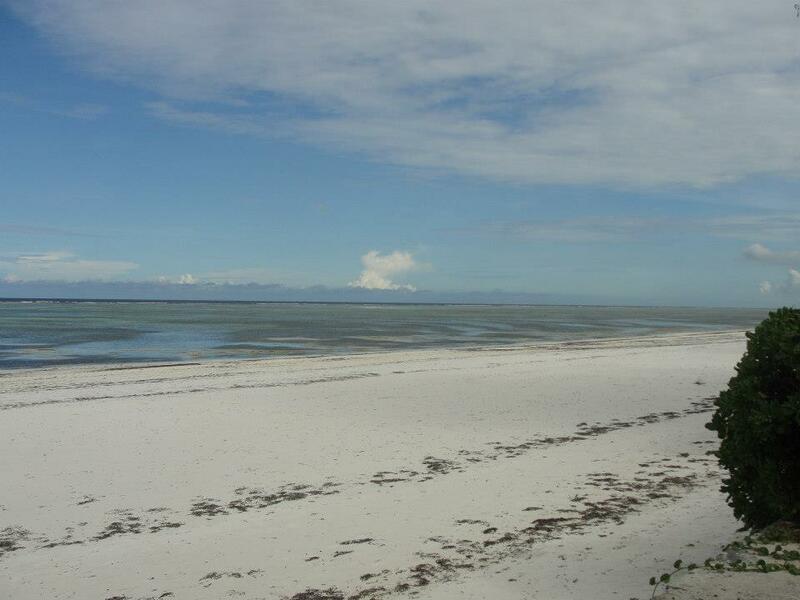 While it is very near Matemwe, this town is so small it really didn’t make a difference. There was no market (no fruit) much less anything else to buy, see or do. The town was populated by maybe 1000 very nice people (non-English speaking), but definitely not a resource for a traveler. Overall there was not much to do or see right around Panga Chumvi, the majority of the tourism on Zanzibar is over on the west side in Stone Town or up on the northern side of the island. Rather than being the sight of lots of tourism, the east side of the island seems to be the working part of the island. 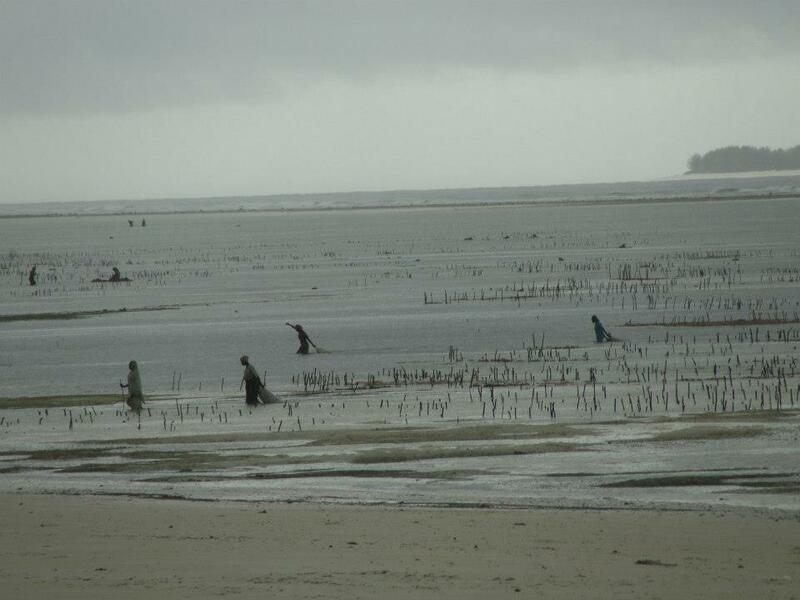 The locals were farming sea weed from in front of our hotel and all along the coast. In the mornings they would pull it from the water and hang it to dry for the day on fence like structures built back from the shore. Now this wasn’t the beautiful, picturesque sight that one often finds when searching for images of Zanzibar, but it was super interesting to see and the solitude, calm, local feeling that we experienced was just what we were looking for. During the day we enjoyed walking up and down the beach, shelling and taking in the sights, sounds and smells. There were miles of wonderful beach in both directions to explore. In doing this though, one has to be mindful of what season they are in. We were there at the beginning of the rainy season, so just about every day we got caught in some degree of torrential downpour. 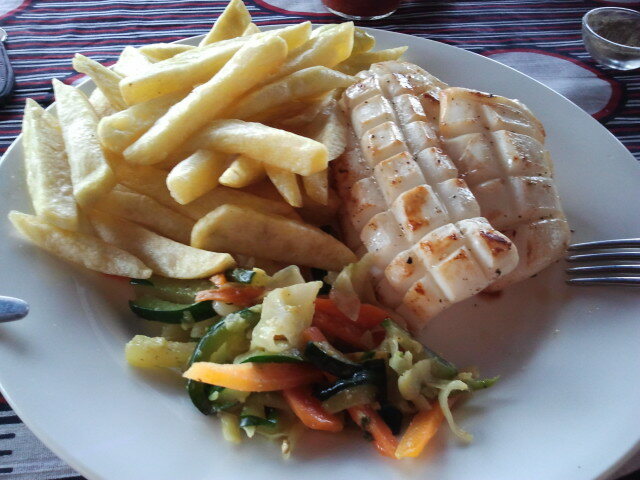 There are a number of very similar little hotels/restaurants along the coast. These were fun to check out and stop into for a quick refreshment. We went snorkeling with a small group for ~2hrs just off of the cost one day near a few little islands. The outing was about 2 hrs and equipment was provided for about $25 USD/person. I have to admit that the experience didn’t measure up to the snorkeling in Belize, but I don’t think that any snorkeling that I ever do again will measure up to that experience. To be fair, the cost was also a fraction of what we threw at the entire day of snorkeling (with private tour guides and a fresh beach side lobster lunch…but never mind…) in Belize. So we found Herbs and Spices listed as a hotel in one of our travel books as we were preparing for our trip. On Trip Adviser (and frankly everywhere else that I’ve looked) it is only listed as a restaurant. I assure you however, it’s definitely a hotel as well! Our stay at the Herbs and Spices Hotel was very nice. Our room at Herbs and Spices was clean and welcoming. 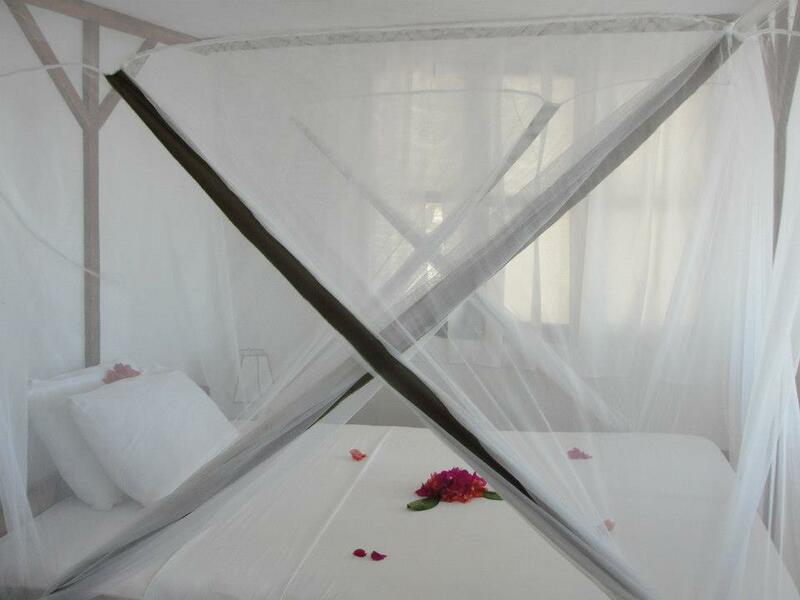 The beds were comfortable and were equipped with nice mosquito nets so we could open our big windows at night for an evening breeze. We had a private bathroom that was clean with a western toilet and a shower. Now we were supposed to have warm water, but there always seemed to be one reason or another why it was not available. I think I had one shower where it wasn’t totally cold, but that was about as good as it got. Considering the ~90 F temperatures, this definitely wasn’t the end of the world. The staff at Herbs and Spices was courteous and helpful. Our interactions with them were rather limited however. Herbs and Spices is located on the main road just on the southeast corner of Arusha. While the street is busy, it has a nice walking path to town. It is about a 20 minute walk into town, with many friendly people along the way. There is also a well stocked convenient store about 10 minutes away by foot. Our stay at the Hotel Hibiscus was awesome. The common areas were welcoming and clean. There was a comfy front porch that was great for read on during the day and a fire ring out back that looked like a lovely area for night time activities. (The evening temperatures of +80 F and previous engagements prevented us from checking this out during our stay.) Inside there was a living room with plenty of seating, a little library with books to share and a sizable community dining area. A really delicious breakfast spread was served each morning in the indoor common area. Options included, coffee and tea, oatmeal, fruit, yogurt and toast with jam and peanut butter. It was a great way to start the day, it was also a great way to meet and get to know other guests staying at the Hibiscus. The owner, Rebecca, and the staff Rosie could not have been better! They were sooooooo welcoming and friendly and helpful. 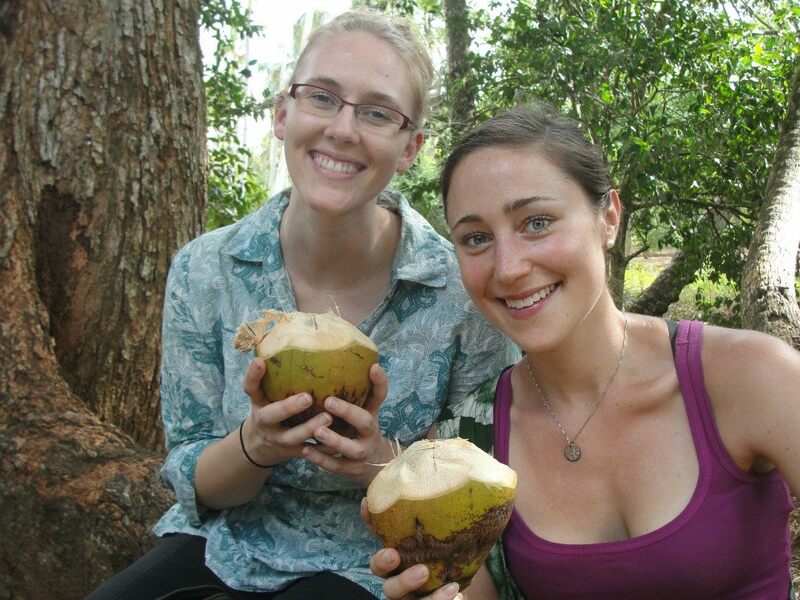 You could really not ask for better hosts! Rebecca even drove me to the packet pick up site for the marathon when she found out I had no idea where I was going. They were absolutely fantastic. The Hibiscus is located just north of the main part of Moshi. It is a quick (15 min) walk to the town center and the dala and bus stands or a 5 min (3000 $TSH) cab ride if you have lots of luggage. It is also just a quick (10 min) walk to the start of the (2011, 2012 and 2013) Mt. Kilimanjaro Marathon! This was a very luck coincidence for us as we just selected The Hibiscus based on its reviews and adorable pictures on Trip Adviser (which it totally lived up to). SCORE! Unfortunately, it is also about 1 American block away from Zumbaland – which is rather loud all day and late into the night. This would probably be my one and only complaint.